The Ancient Bookshelf: Interpreting women out of the New Testament? There are a handful of spots in the New Testament where interpreters have debated whether or not a woman is being referred to. Perhaps the most well-known example is 2 John, which opens like this: “The elder to the elect lady and her children . . .” (1). The author addresses this “lady” again in verse 5, and closes with a greeting from “the children of your elect sister” (13). Interpreters debate whether we encounter here a female personification of Christian communities, or whether the text is talking about an individual female leader. This discussion goes back to the early church. 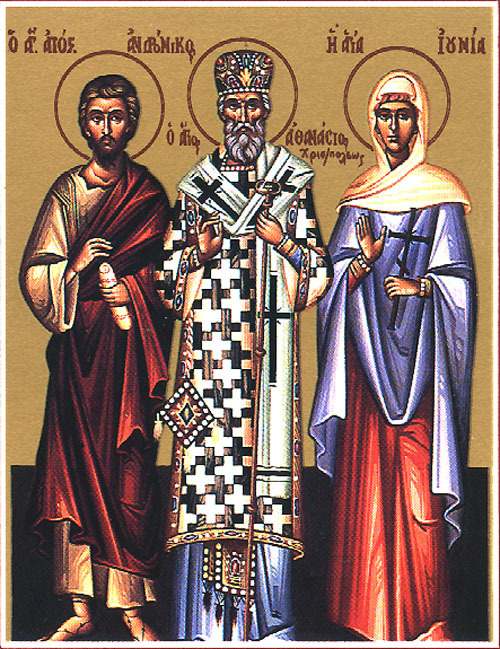 Another interesting example is the identity of Junia, who is mentioned in the closing greetings of Paul’s letter to the Romans: “Greet Andronicus and Junia, my relatives who were in prison with me; they are prominent among the apostles, and they were in Christ before I was” (16:7; NRSV). In some Bible translations you’ll find “Junias” instead of “Junia.” This reflects debate over whether this figure is female (“Junia”) or male (“Junias”). The evidence supports understanding this as a reference to a woman named “Junia.” But, the gender identity of Junia continues to be a hot topic in some circles, specifically within those church traditions where the ordination of women is still an open question. Naturally, the idea that Paul mentions a woman apostle has some relevance for the discussion . . .
Women Priests: A Catholic Commentary on the Vatican Declaration. Edited by Arlene Swinder and Leonard Swindler. New York: Paulist Press, 1977. Readable online! Epp, Eldon Jay. Junia: the first woman apostle. Minneapolis: Fortress Press, 2005. Fàbrega, Valentin. “War Junia(s), der hervorragende Apostel (Röm 16,7), eine Frau?” Jahrbuch für Antike und Christentum 27/28 (1984/85): 47-64. Wolters, Al. “IOUNIAN (Romans 16:7) and the Hebrew name Yeḥunī.” Journal of Biblical Literature 2 (2008): 397-408. “She who is at Babylon, who is likewise chosen, sends you greetings; and so does my son Mark” (RSV). “Your sister church in Babylon, chosen together with you, sends you greeting; and so does my son Mark” (NRSV). So is it “she who is at Babylon” (whoever that may be), or “your sister church in Babylon”? As Judith Applegate notes, the Greek is literally something along the lines of: “the (feminine form) in Babylon co-elect (feminine form)’. Greek has grammatical gender, like German, Italian, and lots of other languages. What we see in this verse is an adjective in the feminine form “the co-elect.” Adjectives can of course modify a noun “the co-elect [insert a noun here].” But they can also be used as substantives, where they basically function as nouns. For example, in English, we can say “the good dog,” “the bad cat,” and “the ugly Guinea pig.” Or we can use them as substantives: “The good, the bad, and the ugly.” In this verse, the adjective is used as a substantive, which leaves us wondering, who/what exactly is “the co-elect”? The church in Rome, with the word “church” implied. In this case the word ekklesia (“church”), which is feminine in Greek, is implied. Some early scribes and translators actually added this word into the text, showing that this is how they understood the verse. John H. Elliot has argued that a different word with feminine grammatical gender, “brotherhood” (adelphotēs), is implied here. An actual, literal, living and breathing, non-metaphorical, woman. This interpretation sees “the co-elect in Babylon” as an unnamed individual, who is paired in the greeting with a named individual, Mark. Some have suggested this might have been Peter’s wife. Others that she was a leader or missionary in the church, who was known to the audience. Applegate, Judith K. “The Co-Elect Woman of 1 Peter.” New Testament Studies 38 (1992): 587-604.